Playing with the Kansas City Chiefs Jazz Band in the Club Level for home games at Arrowhead Stadium in Kansas City. “The American Jazz Museum All-Stars” included: Christopher Burnett, alto saxophone, Greg Carroll, piano and vibes, Bill McKemy, bass, and Matt Leifer, drums with other musicians as occasional guests. 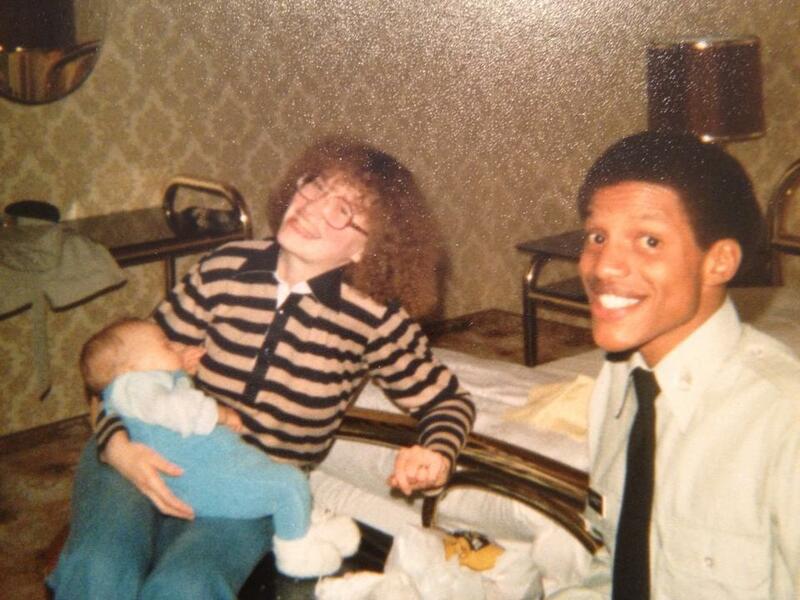 THE RETURN: Micah, Terri and Christopher Burnett returning stateside to Fort Meade, Maryland after living in Germany while on assignment with military bands (1980). 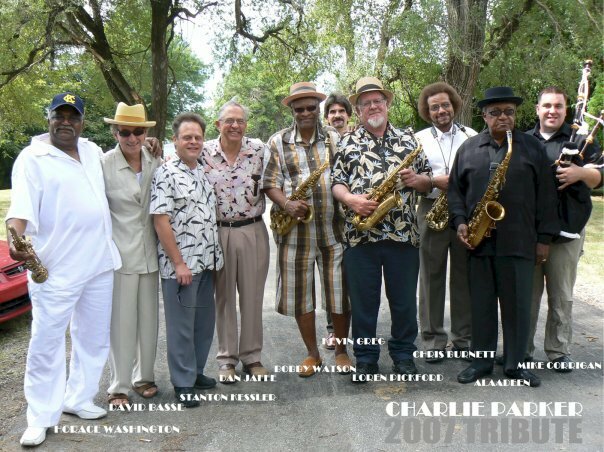 2007 Charlie Parker Tribute – Participating musicians shown (L-R) are: Horace Washington, David Basse, Stanton Kessler, Dan Jaffe, Bobby Watson, Kevin Gregg, Loren Pickford, Christopher Burnett, Ahmed Alaadeen, and Mike Corrigan. Burnett Music Company was formed in 1979 by Christopher Burnett and Terri Anderson Burnett. 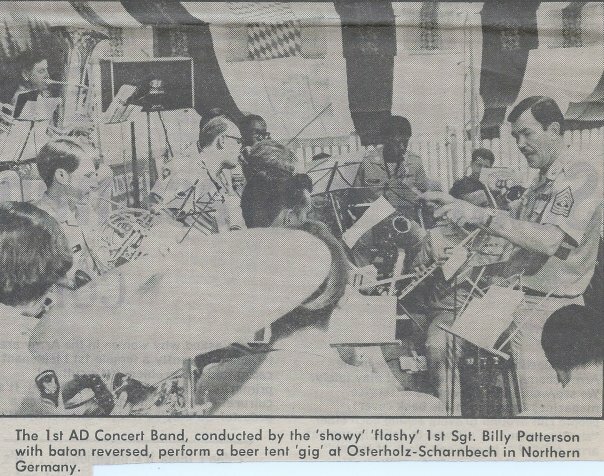 Newspaper clipping showing both Terri Anderson Burnett (piccolo, flute) and Christopher Burnett (alto saxophone) performing a festival concert with the Army band in Germany. 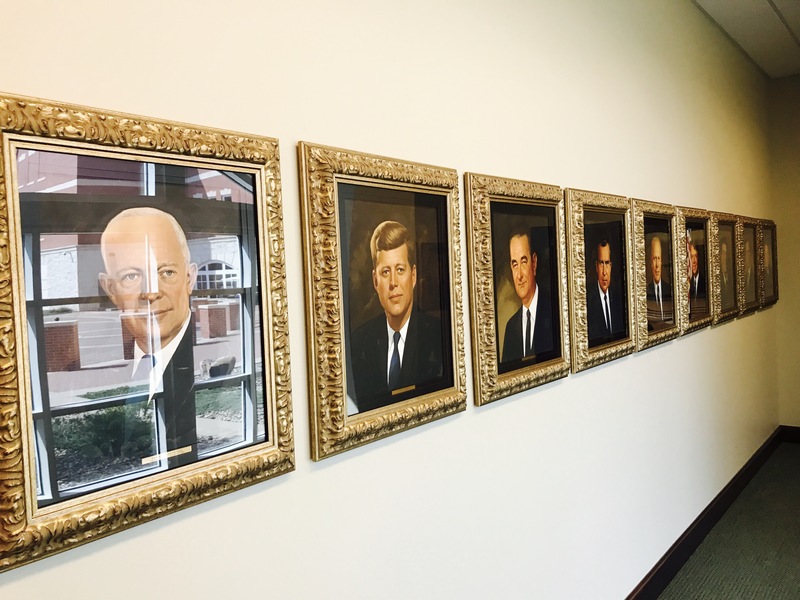 US Presidental portraits reflecting the Burnett’s lifetime from Eisenhower-era to present. This display is at the Command and General Staff College at Fort Leavenworth, Kansas. 1974 – Accepted to attend the University of Kansas as a Fine Art Major, however qualified to enlist in the military bands directly after graduating high school and signed on as a Professional Musical Performing Artist instead. 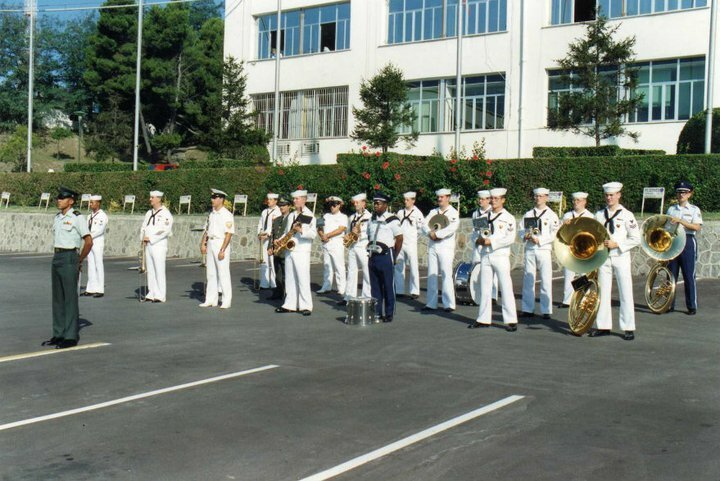 1974 – Passed auditions for US Air Force music program; and, for US Army Bands Career Program – chose Army. 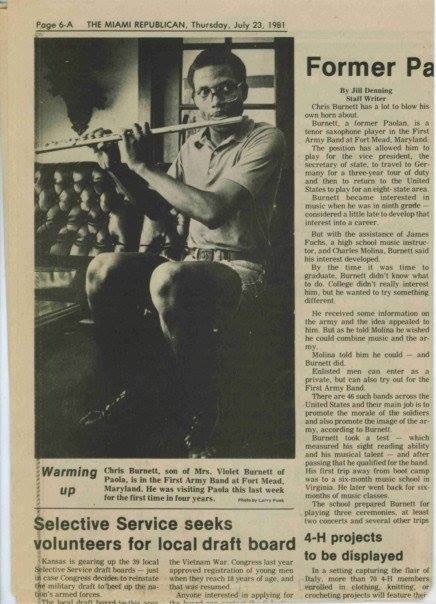 1974 – PROFESSIONAL MUSIC CAREER BEGINS: US Army Basic Training at Fort Leonard Wood offered a job opportunity with The White House Communications Agency (WHCA) due to high aptitude test scores, but remained on path with the military to work as a Professional Musical Performing Artist instead. Feature article in The Miami Republican newspaper by Jill Denning, Thursday, July 23, 1981 (Age 26). 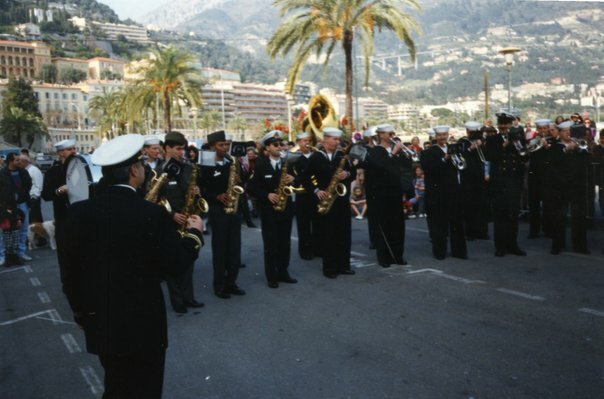 1985 – CAREER HIGHLIGHT: Offered 02S Jazz Saxophone position with US Military Academy Band’s Jazz Knights: was deemed mission essential and not released for reassignment. Christopher Burnett was the official Conductor of the NATO Ceremonial Band during all dignitary honors ceremonies held at Headquarters of Allied Forces Southern Europe in Naples, Italy. Freda Proctor and Terri Anderson Burnett (flautists) in Studio A at C.R. 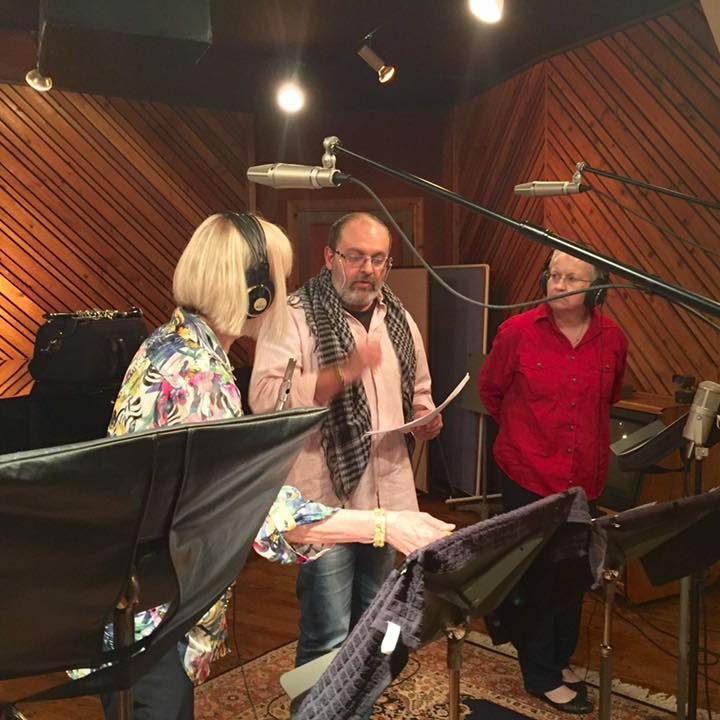 Sound (Kansas City) with Italian jazz piano maestro Dino Massa during the “Echoes of Europe” CD recording sessions. 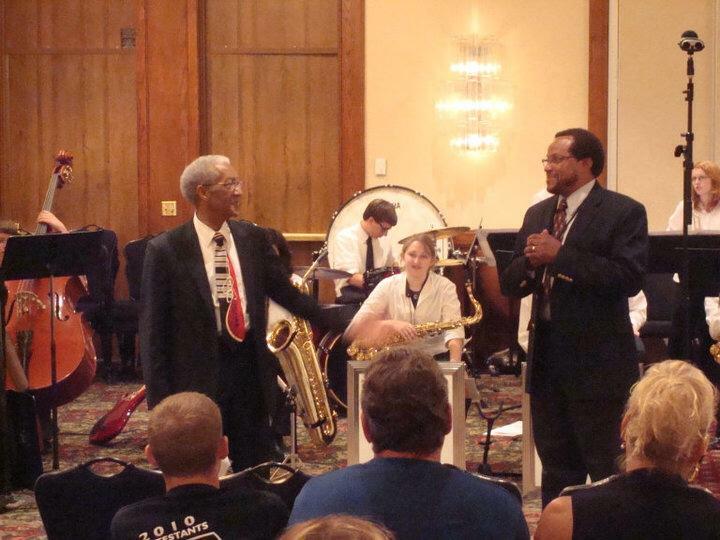 Christopher Burnett with the founder of the original Kansas City Youth Jazz Program, Mr. Leon A. Brady, giving a jazz improvisation clinic at the Kansas Bandmasters Association convention. 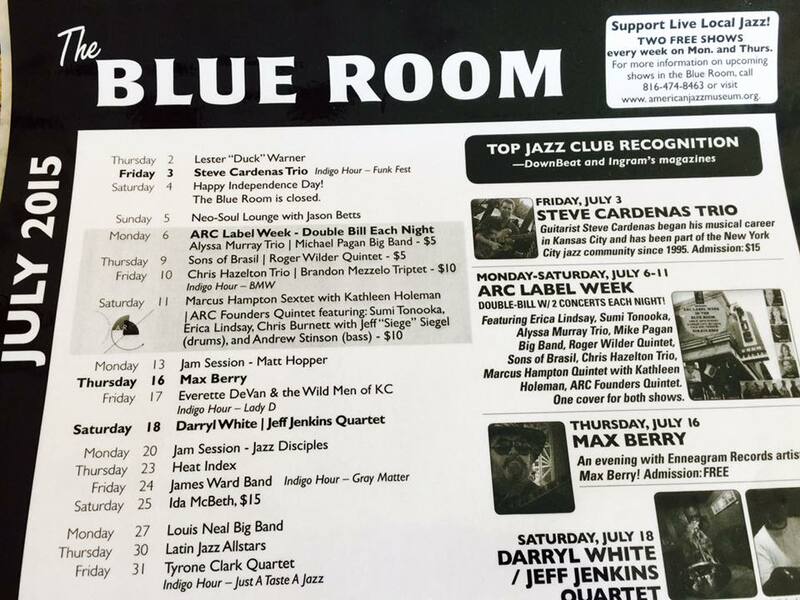 Mr. Burnett produced the highly successful ARC Label Week in the Blue Room jazz club, a partnership between the Artists Recording Collective and the American Jazz Museum. 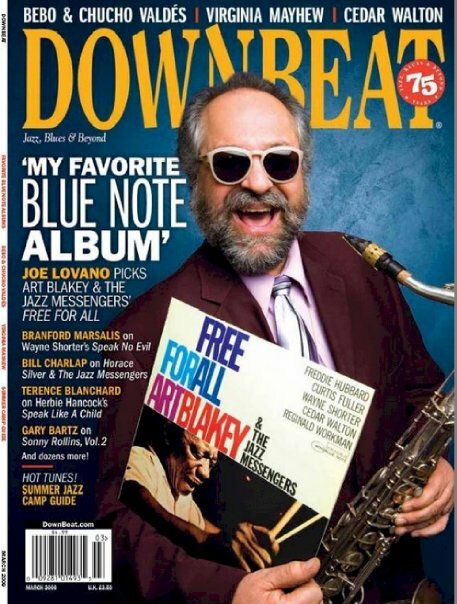 2001 – JAZZ JOURNALISM: Started writing articles for the original “Musings In Cb” column online at All About Jazz – a comprehensive portal and arguably the largest jazz website in the world. 2002 to 2007 – COMMUNITY SERVICE: Interned as Record Label Manager and Staff Writer for a private Kansas City-based music label. Performing with an all-star Jay McShann memorial tribute big band by invitation of Alaadeen. 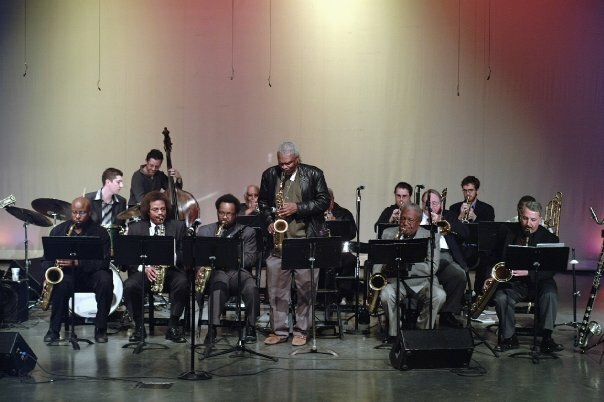 (L-R) Gerald Dunn, Zack Albetta, Craig Akin, Christopher Burnett, Dennis Winslett, Al Pearson, Bobby Watson (soloing), Clint Ashlock, Alaadeen, Unknown, Nick Howell, Louis Neal (hidden), Kerry Strayer. 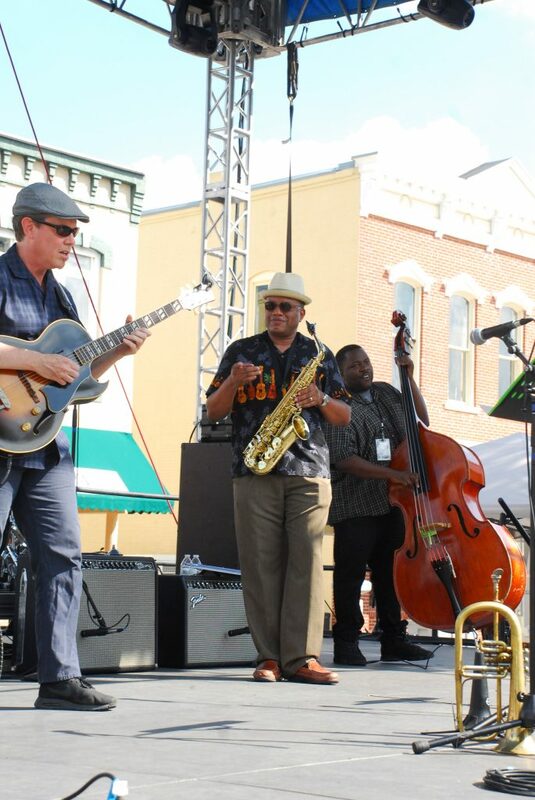 Christopher Burnett Quintet played a well-received set at the 28th annual Roots Festival in 2017 at Paola, Kansas. Mr. Burnett’s jazz quartet made its KC area debut at the 2002 Roots Festival. 2012 – Official Endorsement: Chris Burnett is a CONN-SELMER PERFORMING ARTIST AND CLINICIAN. 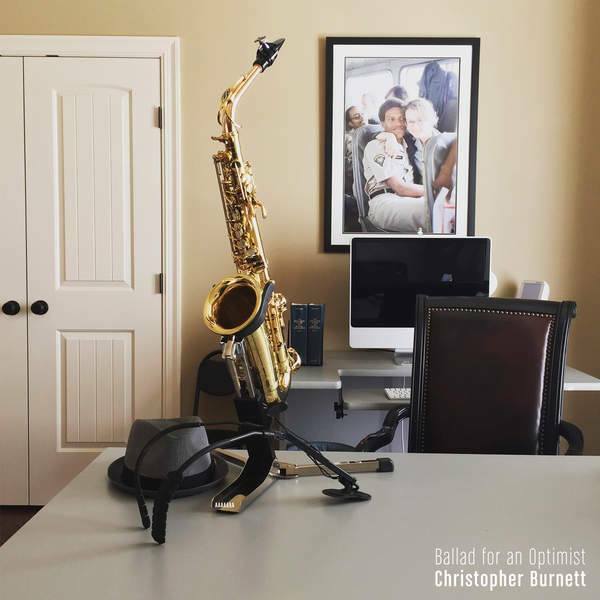 Chris Burnett plays Selmer (Paris) Saxophones exclusively. 2013 – REMASTERED COLLECTORS EDITION: Never satisfied with the original engineering on his debut recording, Chris Burnett hires Don Miller of AIRBORNE AUDIO PRODUCTIONS to remix and remaster the project. ARC-2499 TIME FLIES (Remastered Collectors Edition) releases digitally in April and special edition CD in November on the Artists Recording Collective (ARC) label. 2014 – MARCOM HIGHLIGHT: Successful Marketing and Communications Manager for the new non-profit catalyst organization, Kansas City Jazz A.L.I.V.E. (Kansas City) contributed to significant and sustained media coverage at both, the local and national levels. 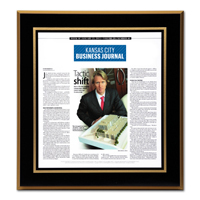 His team was specifically cited in a Kansas City Business Journal article. 2014 – ADJUNCT PROFESSOR OF MUSIC: After refining his work in education to include a small private studio of students, working on the faculty of the Metropolitan Jazz Workshop program, and conducting clinics, Chris Burnett officially joined the music faculty as a woodwind instructor at Metropolitan Community Colleges (MCC-Penn Valley). 2014 – THE NEW QUARTET: Maintaining a working group to perform and record his original work, Chris Burnett forms a new ensemble using his unabbreviated first name in the title of the group – CHRISTOPHER BURNETT QUARTET to anchor the project. CbQ released “Firebird“, the first single from the new album on Labor Day, September 1, 2014 on the Artists Recording Collective (ARC) label. 2015 – STUDENT FEATURED: A former Chris Burnett saxophone student, Houston Smith is featured on Kansas City’s FOX television news affiliate. FOX 4 News “is Working 4 You” to spotlight outstanding young people and their positive accomplishments. In their weekly report called “Reaching 4 Excellence” they meet young achievers in subjects like academics, the arts, leadership, community service, volunteerism, career exploration, overcoming obstacles and heroism. Watch for Reaching 4 Excellence every Wednesday on Fox 4 News at 9 p.m. and every Thursday on Fox 4 News at 8 a.m. and noon. 2015 – ARTS GRANT PANELIST: The Missouri Arts Council appointed Mr. Burnett to serve on the Advisory Panel for Multidiscipline for one term, ending June 30, 2016. 2016 – GUEST SPEAKER: Mr. Burnett was the guest speaker for the 2016 Martin Luther King Day Celebration at Fort Leavenworth. 2016 – KEYNOTE SPEAKER: The Edward Jones Center for Entrepreneurship at Drury University invited Mr. Burnett to be its first speaker in their ‘Self-Employment in the Arts’ series for 2016. Download the PowerPoint PDF of Mr. Burnett’s lecture, “The Story of a Song”. 2016 – JOB TRANSITION: Mr. Burnett leaves employment with the American Jazz Museum after 5 years of significantly contributing to that organization mission working primarily as Marketing Manager and Director of Communications, with concurrent duties at various points as Acting CEO and Director of Operations; and, immediately resumes his personal career as an arts organization & business professional, recording artist, educator and entrepreneur based in his native Kansas City area. 2016 – Mr.Burnett is Member #10000839 of the Society of Professional Journalists. 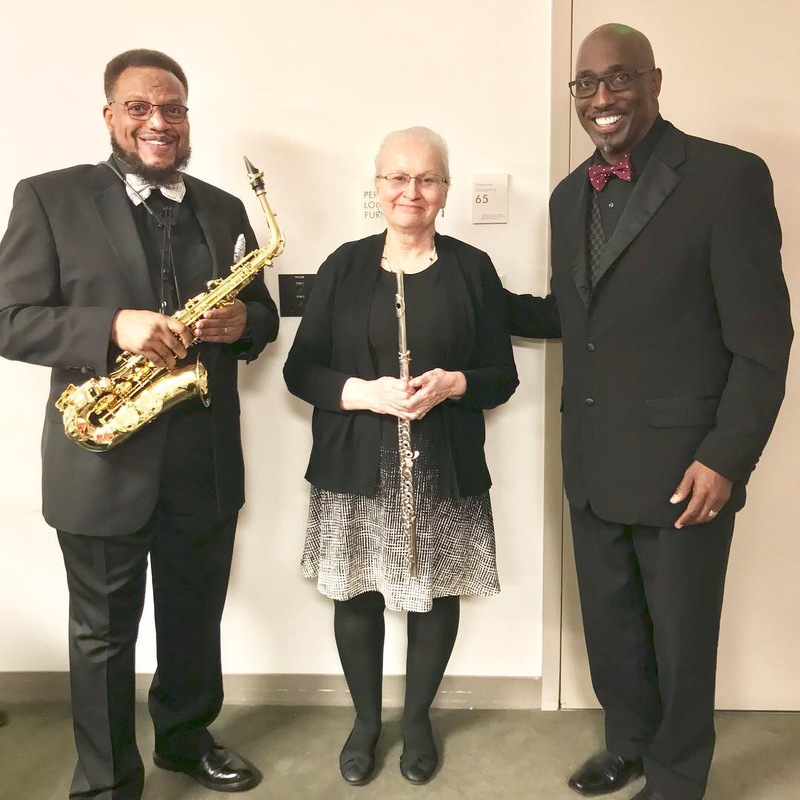 2016 – In addition to being a Selmer (Paris) Saxophone endorsing artist, Mr. Burnett is now also an Official Conn-Selmer Artist Clinician which allows for funding support to organizations that utilize his educational services. 2016 – Mr. Burnett was contacted by Tarleton State University (Member of the Texas A&M University System) Fine Arts Department to present a Music Business Webinar Workshop on November 30th which was well received. This session highlighted the importance of creating innovative solutions in response to ongoing infrastructure issues of music economy. 2017 – KEYNOTE SPEAKER: Mr. Burnett was invited to give the keynote speech for the VA’s Central Plains Consolidated Patient Account Center (CPAC) annual Black History Month luncheon at the Dwight D. Eisenhower VA Medical Center. 2017 – JAZZ JOURNALIST ASSOCIATION: Mr. Burnett is a professional – voting member of the Jazz Journalists Association. 2017 – KANSAS PRESS ASSOCIATION AWARD: Mr. Burnett received one of the 2017 KPA Awards of Excellence as Staff Writer for the Fort Leavenworth Lamp newspaper Third Place award, Non-daily Division III. 2017 – JOB TRANSITION: Mr. Burnett resigns position as Staff Writer and Reporter with the Fort Leavenworth Lamp Newspaper after a very successful tenure. 2017 – JAZZ ARTISTRY NOW: Mr. Burnett along with his wife, Terri Anderson Burnett, successfully launch the new model online arts magazine featuring commentary, reviews, articles and photography, titled: Jazz Artistry Now. 2017 – ASSISTANT BAND DIRECTOR USD 453: Mr. Burnett began officially working as an assistant with Dr. Jared Prost at Leavenworth High School teaching woodwinds and helping with the jazz program. 2018 – KANSAS PRESS ASSOCIATION AWARD: Mr. Burnett received one of the 2017 KPA Awards of Excellence as Staff Writer for the Fort Leavenworth Lamp newspaper First, Second and Third Place awards, Non-daily Division III. 2018 – KANSAS MUSIC EDUCATORS ASSOCIATION IN-SERVICE WORKSHOP CLINICIAN: Mr. Burnett was selected to present a clinic at the 2018 KMEA ISW in Wichita, Kansas. 2018 – LICENSING DEAL: Mr. Burnett signed a licensing deal with GreenLadyRadio.com. The royalty-paying 24-7-365 broadcasting radio station will play his music at its various jazz venues in Kansas City as well as continuous worldwide streaming online. 2018 – OFFICIAL KANSAS TOURING ARTIST ROSTER: Mr. Burnett was selected by the Kansas Arts Commission for inclusion on the state touring roster. This qualification includes the Mid-America Arts Alliance 5-state region. 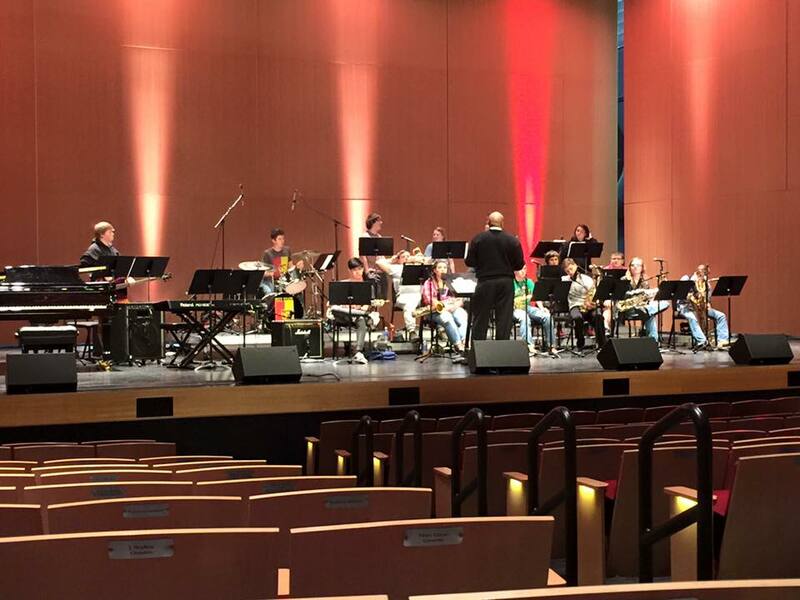 Christopher Burnett rehearsing the KMEA Honors Jazz Band at the Bicknell Family Center for the Arts located on the campus of Pittsburg State University in Pittsburg, Kansas. The three Military Awards listed are only a portion of the awards and letters received – the total of which would be too numerous to present in context here. Photographs are random highlights from all eras and credited as applicable.